Fruit bat eating banyan tree fig (locally called ‘nika’), nika fig is one of the main diets of fruit bats in the Maldives. Two species of megabats had been recorded in the Maldives, namely Pteropus hypomelanus maris and Pteropus giganteus ariel. 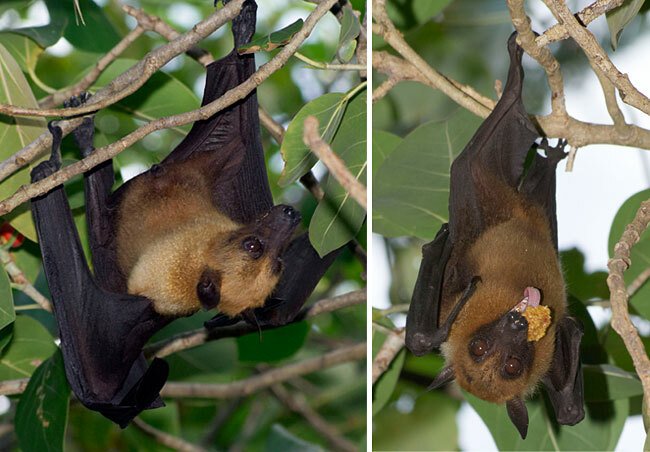 Although 16 subspecies of fruit bat has been documented and common world wide, the subspecies Pteropus hypomelanus maris of the Maldives is considered endangered due to excessive culling and limited distribution. Fruit bats get their incorrect name from the impression that main diet is fruit when in reality these megabats concentrate more on nectar and pollen. The name “fruit bat” is mainly due to the fact they look as if dark fruit hanging in trees. Fruit bats play important role in the atoll ecosystem of the Maldives, in seed dispersal and pollination along with limited birds and insects. Fruit bats disperse seeds in their droppings or carrying fruits even to distance islands far away from the parent tree, where they normally roost and the same time bats act as agent of pollination. Fruit bats are extremely vital in Atoll islands of the Maldives with limited bird species and they are the only flying animals huge enough to carry large seeds. Bat pollination services are required for some commercially produced plant products, including mangoes, bananas, guavas and coconuts. In all, more than 40 plant families include plants pollinated by bats. Pteropus giganteus ariel common and found throughout the Maldives archipelago. They seem to adapt quite well to humans and thus not threaten or endangered in the Maldives. 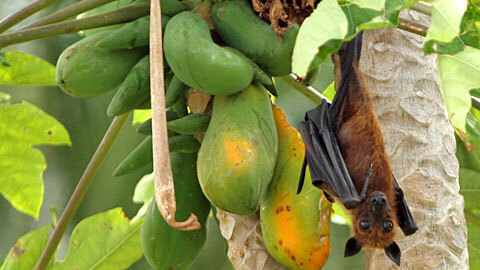 Most farmers in the Maldives consider bats as pest destroying their fruits and vegetables. Although Pteropus giganteus ariel is abundantly found, the subspecies Pteropus hypomelanus maris of the Maldives is considered endangered due to excessive culling and limited distribution. Fruit bat breeds from July to October. Unlike microbats, megabats have very good eyesight and roost in trees where mating takes place. A single offspring borned by the female after a long pregnancy of five months. 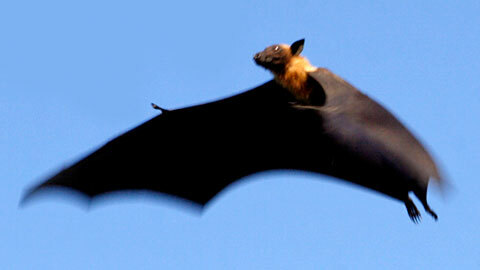 thank you for your recent article about Fruit Bats in the Maldives. Coincidently, me and my collegue Silke Heucke (University of Vienna) are currently planning a fruit bat project in the Maldives for 2009. We would be thankful to any tipps, hints or ideas from the local community all over the Maldives, whether professionals, farmers or… anyone! Thank you very much for the interesting article on fruit bats I read on your web site. I spent many hours watching and photographing these fascinating creatures last January, when visiting Embudu island. I was surprised to learn how many plants depend on these bats for colonization. I enclose a couple of photos, that you are free to use for educational purposes, such as your web site. The bats were eating figs, I am not sure of the species of Ficus. In one photo you can see the bat enjoying the fruit! Thank you for your work in striving to keep the Maldives a paradise-like destination.